Gua sha is an underutilsed, but very effective treatment for numerous conditions relating to inflammation and musculo-skeletal pain. It involves pressing and rubbing a hard edge tool over the surface of the skin. Crudely, think of it as massage with a solid implement rather than hands. Perhaps one of the reasons it hasn’t been more fervently celebrated is the unsightly marks it can leave on the skin. Whilst it doesn’t hurt, the process of gua sha moves blood closer to the surface of the skin, which can leave a red rash or marks. This typically resolves within 2 days. A tool is used to press and rub on the skin. This object can be anything. Jade stone, plastic, stainless steel and in an emergency even a blunt spoon or jam jar lid can be used. Research has shown that gua sha promotes the function of an enzyme, HO-1, which has anti-inflammatory effects. This can make it effective for everything from auto-immune diseases to hepatitis. Beyond this physiological function, the simple act of rubbing the tool over an area can break down knots in muscles and fascia. In areas of poor circulation, which may manifest as cold-ness, numbness or pain gua sha increases blood circula-tion. Research in University of Duisburg-Essen in Essen, Germany investigating the physiology of gua sha showed a 400% increase in surface blood circulation after treatment.Gua sha can also be effective for menoapusal women. A study at First Affiliated Hospital of Nanjing University of Chinese Medicine in China 2017 took 80 women inperi- menopause to see if gua sha could help their symptoms (https://journals.lww.com/menopausejournal/Abstract/2017/03000/Effect_of_Gua_sha_therapy_on_perimenopausal.10.aspx). The participants receiving gua sha re-ported reduced flushes, insomnia, nervousness, fatigue and headache compared to the control group. Gua sha had no impact on estrogen, FSH or Luteinizing Hor-mone which suggests it works in a way other than affect-ing hormones. In Chinese medicine the gua sha expels heat from deep within the body. Heat in Chinese medicine can manifest as nervousness, restlessness and feeling hot or sweaty. Whilst not a scientific explanation observation has shown be that venting Heat (via gua sha or acupuncture) can often make patients feel calmer and cooler. Generally very good. 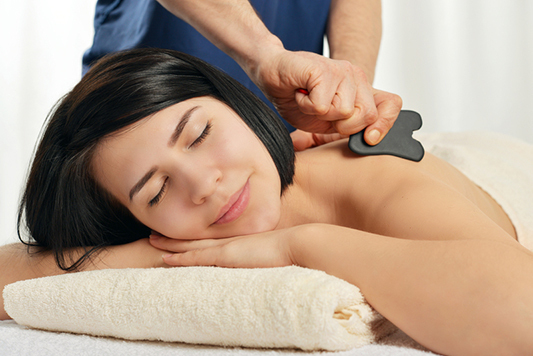 It is not a painful experience and you won’t ache like you would after a strong sports massage. The only drawback – a red rash that will take a couple of days to subside.